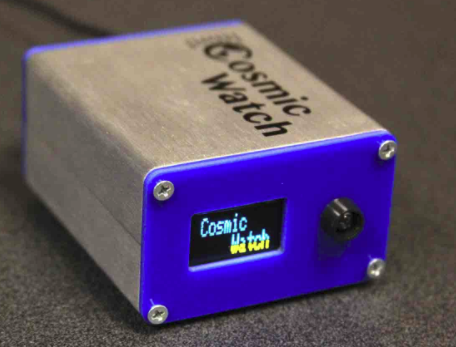 The Cosmic Watch project is sponsored by MIT and consists of individual, small modules each capable of logging and displaying cosmic rays as they arrive. It uses SiPM detectors and plastic scintillator material. Although each module has only one detector in it they have a way to stack them and create a master/slave arrangement that is a coincidence detector. Inside each module is the scintillator/SiPM combination wrapped in black tape, and a main board that contains a Arduino Duo. The Arduino performs the house keeping chores of logging the events off to a microSD card. The project has produced an excellent set of YouTube videos that shows the construction steps of the modules and are worth watching if just to see what a proper video looks like. I have ordered a pair of SiPM's from sensL using a special offer for the project. They still cost $130 for the pair. I am also looking for a block of scintillation plastic that I can start working on. You can follow my progress/problems/success and abject failures on my Engineering page.